Samsung Galaxy S is one of the most popular Android smartphone. Samsung managed to sell more than 10 million units of Galaxy s in less than a year. This handset originally comes with the Android 2.1 (Eclair) OS, but Samsung has rolled out the Android Froyo update in may countries, earlier this year. Now we have another good news for Galaxy S users. The recently launched Android 2.3 (Gingerbread) OS will be soon available for the Galaxy s users. Samsung Galaxy S users in the US and other countries are still waiting for the FroYo update, but Samsung Romania recently posted on their official Facebook page that, the much awaited Android 2.3 update will be rolled out to the Galaxy S smartphones by March-end. Samsung Galaxy S users will first get the Android 2.2.1 update on March 20, followed by the Android 2.3 update after few days. 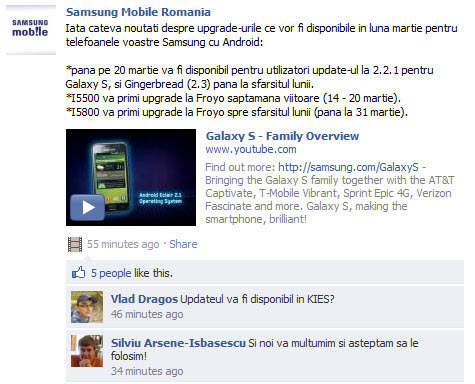 One Response to Samsung Galaxy S To Get Android Gingerbread Update By March?